WATCH spells for ‘World Association for the Protection of Tangible and Intangible Cultural Heritage in times of armed conflicts’. 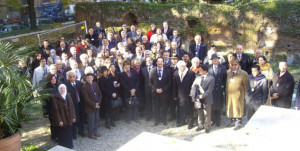 It is a global network of Cultural Heritage stakeholders and a non-profit and VOLUNTEER world association. WATCH does not have any political affiliations, religious or national inclinations, and maintains the strong objective to remain neutral in order to gain credibility from all parties involved in conflicts, disputes, or actual hostilities. To develop an early detection system against risks in cases of destruction, vandalism, illicit trade, looting, pillaging before, during and after conflict. providing support and assistance in the documentation of CH, providing appropriate training programs, raising public awareness & participation, encouraging peaceful resolutions, promoting inter-cultural dialogue, providing interdisciplinary expertise, developing and assisting in contingency planning, disseminating information, creating and maintaining contacts with Military organizations (liaison). How does WATCH achieves its objectives? by establishing means of documentation and digital recording. In case of need, before, during and after times of crisis in the areas of turmoil anywhere in the world.